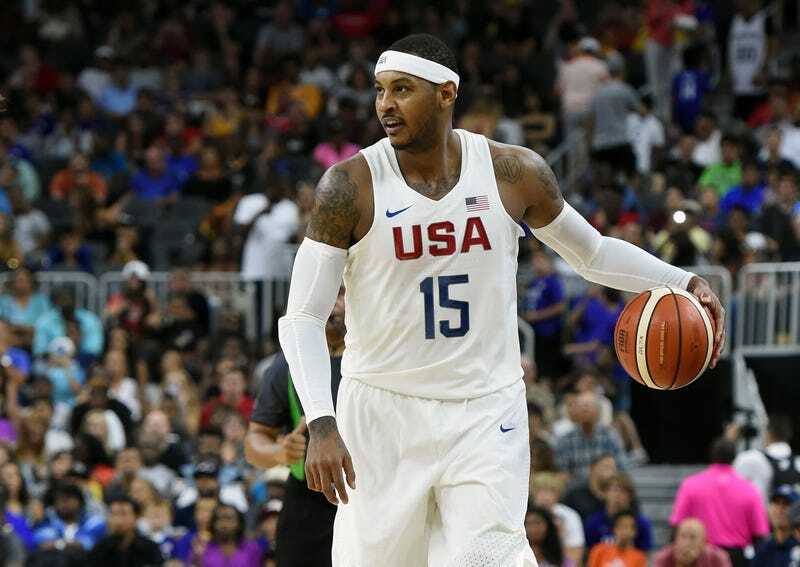 Carmelo Anthony, playing for Team USA, during an exhibition game against Argentina July 22, 2016, in Las Vegas. While Michael Jordan was busy helping sites garner some page views after finally speaking out on police brutality involving black people, which he never does, Carmelo Anthony was busy in Los Angeles with Team USA's women's and men's basketball players holding a meeting with community leaders. Anthony has been vocal about police brutality and has made community service a huge part of his off-court life. Jordan issued a statement Monday saying that he finally had to speak out. As if the world were sitting back and asking, "What does Michael Jordan think about police brutality?" "As a proud American, a father who lost his own dad in a senseless act of violence, and a black man, I have been deeply troubled by the deaths of African Americans at the hands of law enforcement and angered by the cowardly and hateful targeting and killing of police officers. I grieve with the families who have lost loved ones, as I know their pain all too well," Jordan stated. Jordan also donated $1 million to the NAACP Legal Defense and Educational Fund and $1 million to the International Association of Chiefs of Police’s newly formed Institute for Community-Police Relations. For those unfamiliar with the IAC, the organization doesn't have such a good reputation. For example, the organization opposes the demilitarization of police departments and is a proponent of civil asset forfeiture. However, as Anthony spoke to community organizers, he commented about Jordan's statement. "I thought it was brilliant and about time that he stepped up and said what he said," Anthony said. "Because at the end of the day, amongst us, he is our face. He’s an African American above every powerful African American, so for him to step up in the midst of these times right now, it was very big on his behalf. And … it’s not always about money and giving back, but for him to step up and put his money where his mouth at, the timing was perfect." Kudos to Anthony for being a shining example of what athletes should be doing when they're not wearing a uniform.